Hellooooooo ladies!! It has been quite a while! I've been pretty sick over the last little while and I've taken on way too much (work, TAFE, salon) but anyhoo I'm posting again. It's finally Spring here in Aus which means it's time to break out the pretty dresses and pastels in preparation for the racing season. I've never been to the races myself but it's on the to do list! Today I have quick swatches of 2 shades from the Sally Hansen Complete Manicure Spring Racing 2014 collection for you - Pink a Card and Barracuda. I really enjoyed last years Spring Racing collection so how did this years shades match up? "Seven Spring Racing inspired shades of premier polish. As the ultimate colour authority, Sally Hansen has always set the trends when it comes to nail shades. This season is no different – the latest Sally Hansen shades are perfect for as a spring racing fashion accessory and are designed to complement any outfit. From pretty pastels to chic neutrals these new shades of Complete Salon Manicure are sure to have you race-day-ready this spring." Pink a Card is a pastel baby pink creme. 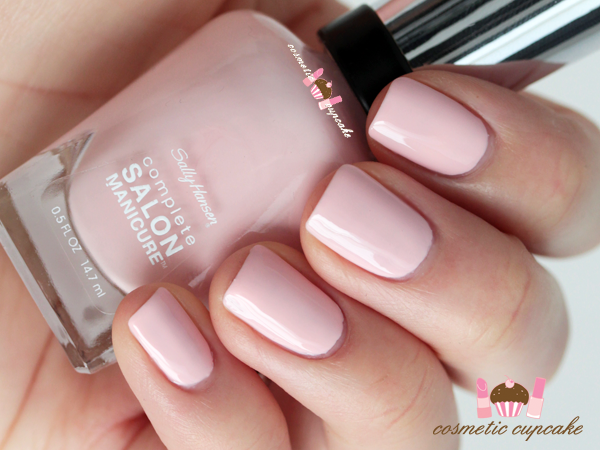 Super soft and the perfect baby pink shade that will compliment any outfit. 3 coats is pictured below. Barracuda is a pale baby blue creme. It was part of last years Spring Racing collection too and I'm glad it was re-released so I could try it out. 3 coats is pictured below. Overall: Pink a Card and Barracuda are spot on for Spring! I love the Complete Manicure polishes as I love the brushes and there's something about the shape of the bottles that's really appealing. The formula on these were a little tricky to work with as they were on the streaky side and definitely require care when applying but they're worth it. I recommend doing thin coats to avoid streaking and allowing plenty of time to dry in between coats. Barracuda in particular was quite watery unfortunately but the end result is worth it. The shades dried quickly to a high gloss shine. Putting the shades side by side it's as though I'm doing a baby gender reveal or something ha! from Priceline, Chemist Warehouse, Target, Coles and select pharmacies nationally. Thanks so much for looking and for keeping up with my totally erratic posting! Hello Chelle. So good to know you through your profile on the blogger. I am glad to stop by your blog post. Though it has to do with the women's cosmatic, it has given me an opportunity to share wtih you about the opportunity you can have to come to Mumbai, India to work with us in the slums of Mumbai bringing physical as well as spiritual healing to the people affilicted by varioius diseases. I am in the Pastoral ministry for last 35yrs in the great city of Mumbai a city with great contrast where richest of rich and the poorest of poor live. We reachout to the poorest of poor with the love of Christ to bring healing to the broken hearted. We also encourage young people as well as adults from the West to come to Mumbai on a short / long term missions trip to work with us in the slums of Mumbai during their vacation time. We would love to have you come to Mumbai with your friends to work with us in the slums of Mumbai. I am sure it will be a rewarding time for you as well as it would be a time for the poorest of poor people to get treatment for their health issues. My email id is: dhwankhede(at)gmail(dot)com and my name is Diwakar Wankhede. Looking forward to hear from you very soon. God's richest blessings on you.